I was a bicentennial baby, so it can be said I was patriotic from birth. Born in 1976 in the city that never sleeps, with formative years at the tail end of the disco era and onslaught of the Reagan decade, I am a sum of those parts. I am also a child of immigrants who to this day remind me of the hardships they experienced in order to provide for me this birthright. I am forever grateful. As is my father, who will openly cry when the American National Anthem is played right before a Yankees game. It is no surprise, that when it came to toys, if it was patriotic in anyway, my dad bought it for me. I even had an ABA basketball, and my dad had no clue what basketball was. He just liked the red, white and blue ball. It did surprise me though, when my dad brought home a Ben Cooper Superman jiggler toy for me. It wasn't sports related in any way, nor was it a glaringly obvious red, white, and blue item. He told me he was at the hardware store and they had them on the counter with a picture of Superman standing in front of the city and one with Superman holding the flag from the movie. Then it clicked for me, Superman to my dad was the ultimate patriot. He was an immigrant who did everything he could to defend his chosen country. My dad found the perfect patriotic toy. This Superman jiggler became a mainstay for me for many years, even though all I knew of Superman at that time was what the Superfriends showed me on Saturday mornings. Sure, the string broke, and the color faded or peeled, and sometimes I would misplace him for long periods of time, but every time I found him, he was elevated to number 1 toy in my room, and my dad was my hero for giving him to me. In 1982 when Superman the Movie was to be broadcast on ABC, I went through my room in a frenzy. I needed to find Superman so I could watch the movie while playing with him. It was necessary. All day long leading to broadcast time was spent in such a pursuit, I had enlisted my mom to help search the basement in final desperation. My father was handling dinner, and he, the man who falls asleep during any and every movie ever made, who's attention to the TV is only reserved for sports, *he* was excited to see Superman. During one of my passes through the kitchen, the phone rang and my dad told me to answer it since his hands were full. It was long distance, I could tell due to the crackle on the line. My aunt's voice carried through, and I remember getting an uneasy feeling when she asked to talk to my father. I handed the phone to him and watched. I remember him looking down and giving short answers. He thanked his sister and told me to get my mom since the movie had started. I didn't even notice. When my mom came upstairs I remember her asking who was on the phone. He looked at her and just said, "My father died." Then he looked at me and gave me a sad smile as he sat in his chair. 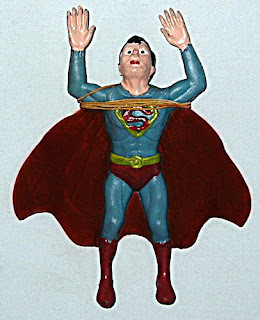 The smile turned into laughter, which confused my mother, until she saw him pull his hand from underneath him holding my Superman jiggler. I don't have any memories of my paternal grandfather, but I know he wasn't overly pleased with my father's decision to follow my mother to America. And yet every time I see a Superman jiggler, I remember that day. I don't remember it as the day I lost a grandparent I barely knew though, I remember it as the day my dad sat on Superman and watched a movie with me without falling asleep.